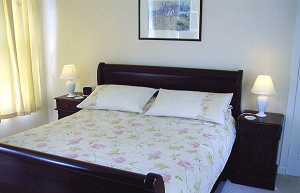 "Rosaburn Lodge is an attractive Guest House situated on the beautiful banks of the River Rosa. 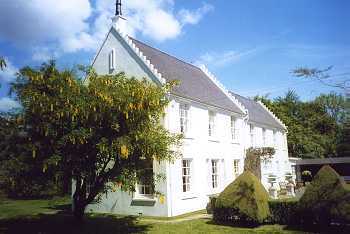 Standing within more than 2 acres of private landscaped gardens it's an idyllic spot on the outskirts of Brodick, ideal for a relaxing holiday"
Rosaburn Lodge is an attractive Guest House situated on the beautiful banks of the River Rosa. Standing within more than 2 acres of private landscaped gardens it's an idyllic spot on the outskirts of Brodick, ideal for a relaxing holiday. As the last Guest House heading north to Lochranza, immediately beyond the Arran Heritage Museum, it is easy to find. There is a bus stop next door at the Museum. Peace, tranquillity, and warm Island hospitality combine with the timeless beauty of the woodland setting surrounded by garden, mountain and sky to create an unforgettable holiday experience. 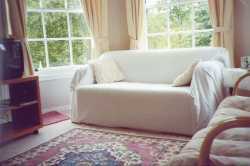 A very comfortable and friendly house:the perfect base to explore the beautiful isle of Arran, all year round. 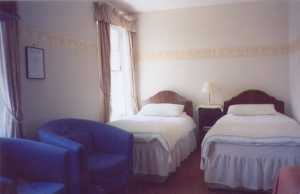 The double and twin room have a sea view. 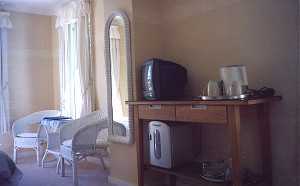 The suite has a baby window over looking the river and goat-fell. Brodick Golf Course fairways lie beyond the Rosa Burn which meanders through the grounds. There is an elegant dining room, offering superb breakfasts with free range eggs from the garden, and a lovely conservatory which acts as a convenient sun trap to relax. Beautiful garden with picnic tables. No need to pack up and move on everyday because of our central location. Beautiful walks starts on our doorstep:Goatfell-Glen Rosa- Brodick Castle and many more to choose from. Ideal centre for cycling around Arran through beautiful countryside with stunning seaviews. 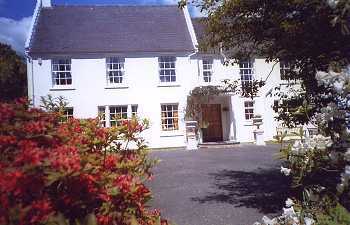 Rosaburn lodge offers reductions for stays of 5 nights or more. Within walking distance are a number of quality restuarants providing locally produced Venison, Lobster, Beef, Seafood and Lamb. 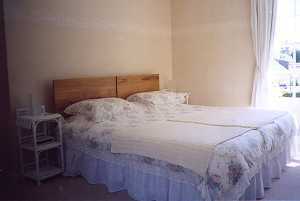 All attractively furnished bedrooms and the suite are light, airy and are complete with full private facilities, colour television, tea/coffee hospitality tray, and central heating. 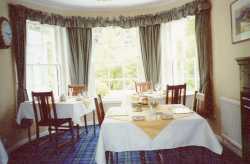 All enjoy charming views over the grounds and garden with numerous bird life and red squirrels. Double and twin rooms have a new bathroom installed. SORRY NO PETS! OR CHILDREN UNDER THE AGE OF 10! Secure overnight parking, and covered facilities for bicycles and motorbikes. Rest assured a warm welcome always awaits you at Rosaburn Lodge and we are sure that you will enjoy the relaxing and informal atmosphere. 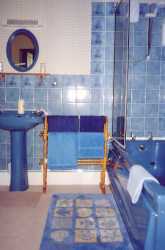 Why not visit the Rosaburn Lodge home page?